We have antivirus on all our computers, which are password protected and behind a Reception desk (and not openly open to the public). Our data is backed up, which is kept in a secure room to avoid loss of data. We regularly reassess our clients so inactive clients can be archived and so will not be contacted unless they contact us directly. Staff that have access to client’s data (via the diary system) are trained to treat this client information as confidential. Our diary system (Stable Management) is held in a secure Microsoft access database which is password protected and can only be accessed at Quob Stables by current staff, who all had individual usernames and passwords. We will follow The Pony Club guidelines regarding Pony Club forms , which will be shredded once the information has been processed by The Pony Club and details updated on the Pony Club’s ‘unity’ database. Show entry forms will be shredded after two months after the show date (as recommended by British Dressage) and are held during this time for any disputes over results to arise. If competitors want to opt out of this, they need to report to Reception to opt out on the competition day. Show details are only shared with My Riding Life and Horse and Hound Magazine (name, score and results) as stated on our entry forms.  We use CCTV around Quob Stables premise which is used for security and in the event of any incidents. The CCTV is only filming public areas of Quob Stables, and signs are clearly displayed to show people that CCTV is in operation. The CCTV cannot be accessed by the public, and the screens are in a back office behind Reception limited to staff only. The CCTV recordings are not stored longer than two weeks unless we manually save a clip of a certain accident, and these clips will only be stored as long as required by our insurance company. Clients are not automatically opted in to our e-newsletters, however they can subscribe on our website home page. We use MailChimp as our e-newsletter processor and clients can opt out online on the email or by contacting us directly. We believe that MailChimp is a well-known and secure processor for our client’s data.